^ "Guernsey State Park". Protected Planet. IUCN. Retrieved 1 May 2018. ^ a b "Guernsey Dam". Geographic Names Information System. United States Geological Survey. ^ "Table 1. Facilities managed by Wyoming State Parks, Historic Sites and Trails" (PDF). SOAR 2021. 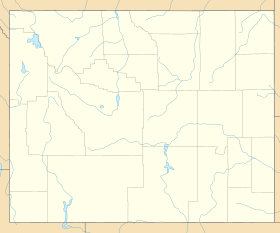 Wyoming Department of State Parks and Cultural Resources. p. 12. Retrieved August 28, 2017. ^ a b c d Begley, Susan; Carr, Ethan (January 6, 1997). "National Historic Landmark Nomination: Lake Guernsey State Park". National Park Service. Retrieved December 1, 2015. 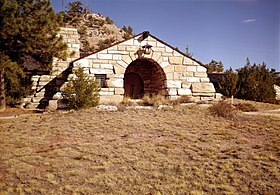 ^ a b "Listing of National Historic Landmarks by State: Wyoming" (PDF). National Park Service. Retrieved December 1, 2015. ^ a b "Guernsey State Park". Wyoming State Parks, Historic Sites & Trails. State of Wyoming. Retrieved August 28, 2017. ^ a b "Guernsey Reservoir Facilities". Bureau of Reclamation. Retrieved June 24, 2016. ^ "Guernsey Dam". National Park Service. Retrieved June 24, 2016. ^ "Lake Guernsey State Park: Accompanying 20 images (photos and plans), from 1977, 1994, and c. 1935". NRHP database. National Park Service. Retrieved December 1, 2015. ^ "Guernsey State Park". Sangres.com. Retrieved December 1, 2015. ^ "Guernsey Museum Digitization Project". Wyoming State Parks & Historic Sites. Retrieved December 1, 2015.